The 500th city of the world's fastest half-life will continue. 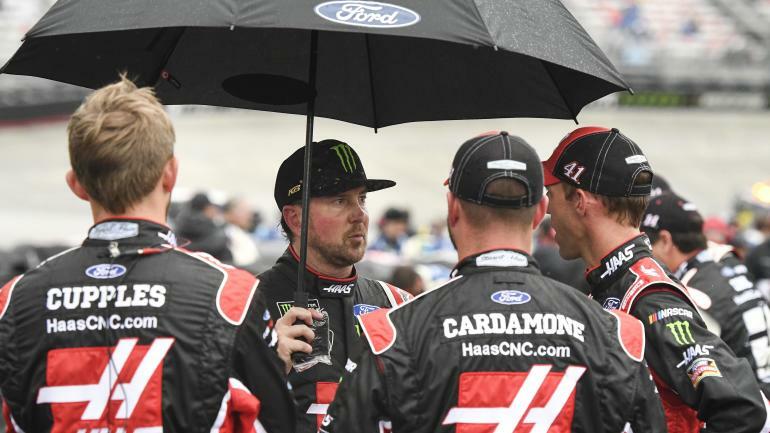 After running 204 laps between four red flags on Sunday, NASCAR decided to postpone the competition in Bristol, Tenn., Until Monday afternoon due to rain in the area. When actions resume, Kyle Larson will be the competition leader as the field hopes to compete for the remaining 296 laps. Rain is forecast for Monday as well, but the competition will be official after the drivers completed 46 turns to end of stage 2. Larson will see joining last week's winner Kyle Busch and Martin Truex Jr. . Kevin Harvick Clint Bowyer and Austin Dillon in the playoff. 00 yards on Sunday and took almost the green and white route in Stage 1, but he got stuck in a truck traffic that ended his day 10 yards before the stage ended. Two red flags were thrown into the scene, the first one was rain and the other was for track cleaning. Brad Keselowski avoids the wreck and continued to win Stage 1 after a one-step win after the delay. Kyle Busch came out in a booming start but not even five laps in the race Michael McDowell went spin and caused a massive ascent over the starting line. Martin Truex Jr., Chase Elliott, Aric Almirola AJ Allmendinger and others all suffered injury with Truex that takes brown of it. They could go green quite soon after the first onset, but Allmendinger encountered more problems just after the precaution came back. Busch was lost and lost the lead at restart and released when Ryan Blaney took the lead. Despite 48-speed (ish) racing, NASCAR threw the red flag and suspended the race when rain came into the area. Blaney went into the race as a coach while Busch fell all the way back to the ninth. After a short 25-minute delay, the engines were pulled back and the cars could get back on the track. Blaney won the competition from the pit under yellow and pushed out to a strong lead at restart. In the same way as last time, caution came out almost immediately. This time, Ricky Stenhouse Jr. lost and spinning after contacting Erik Jones. Stenhouse was not affected by any damage, but had to move back to the back of the field. Blaney again had no trouble keeping the lead on reboot. Some drivers who started on the back of the field – Kevin Harvick, Kurt Busch and Jimmie Johnson – could break the top 15 fairly quickly under green. Brad Keselowski began challenging Blaney for the lead with less than 10 to go into the scene when Blaney took the wrong place at the wrong time. Chris Buescher and Trevor Bayne were lost, with Harrison Rhodes sending high up in the wall and destroying Blaney. He had led 100 yards before he went down. Keselowski emerged from the wreck as a competition leader and drove forward to win Stage 1 via a -Lap sprint after a six-minute red flag. Keselowski entered the pit between stages and lost track position as Kyle Larson assumed the race. The warnings continued early, but as Trevor Bayne was turning 20 turns in step 2. Rain crept into the area with caution and NASCAR decided to throw the red flag again. This lasted about 25 minutes before the cars rolled again. Kyle Larson appeared as a contest leader and took off to a massive lead when the field fought behind him. Kurt Busch reported a possible loose wheel of almost 70 to enter the stage and decided to bring his Ford down. He almost lost it on his way, but took off a strong rescue to keep up the run. With just under 50 turns to enter the scene, the rain began to pour and the red flag was thrown again. Larson was the leader when the race race has been postponed until Monday afternoon. If you missed any action on Sunday, find out our life e blog below. We will be back to action on Monday afternoon when the race is resumed.